I had been working on the thinkSJI.org site a few weeks back and was working to create a drop-down menu. I wanted a top level category with submenu items. This is a pretty simple thing to create in WordPress 3.0. 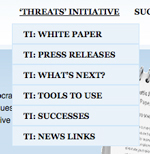 The problem I was having though was that when created a top-level menu item (on that site it was my “‘Threats’ Initiative” link) it was a clickable link. I didn’t want it to be a clickable link, I just wanted it to serve as a header, not as a gateway to another page.